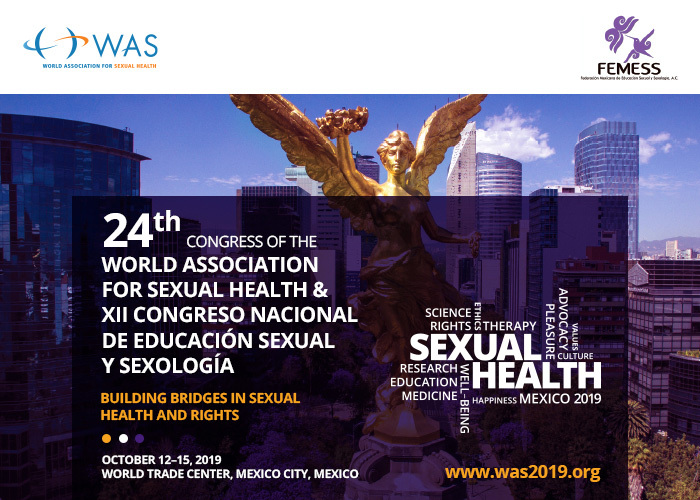 It is with great pleasure that I invite you all to participate at the 24th Congress of the World Association for Sexual Health (WAS) to be held in Mexico City (October 12 to 15, 2019). WAS is the world’s major umbrella organization in the field of sexual health/sexual rights, representing more than one hundred member organizations and several other global organizations from the five continents. Moreover, WAS is a truly multidisciplinary organization and the oldest global organization in the field of sexual health. Participating at the WAS Congress in Mexico will be an opportunity to celebrate and share the diversity and richness of the science and practice of sexual health and sexual rights and meet experts and colleagues from all over the globe. Moreover, it is an opportunity to share and network with a truly multicultural audience from a variety of countries in the five continents while enjoying the atmosphere of one of the most historical UNESCO World Heritage cities in the world. Please kindly helps us to spread the word about the congress among your colleagues. For other possible promotion such as newsletters, please feel free to use the congress promotion materials which are available for download here https://www.was2019.org/promotion-kit/. Copyright © 2019 World Association for Sexual Health (WAS), All rights reserved.